This energy can be energy that moves toward others as you connect with them (either intentionally or just by being in the general proximity) This energy can be also energy to moves toward you as in the case of those who receive the emotions of others just by being in the proximity. You tend to be the Caregiver (primarily concerned about and for others) even at the expense of your own health and needs. Unless you attach an emotional significance with time, you are relatively nonchalant about time schedules and deadlines. People who need to be healed are drawn to you. They may tell you that, no matter what you say or do, they feel better after being around you..” (However, you may not feel good after being around them) Please also note that even if a person needs to be healed doensn’t mean that they are at that place of accepting to be healed. You feel the emotions of others. Their emotion becomes your emotion. You tend to put others at ease as this puts you at ease. You experience unexpected waves of emotion without a noted cause. Even as a psychic medium, I am very science oriented. I love to follow a trail of a+b yields to c and then c travels to d … and so on and on. This trail following allows my left brain to go “ah ha” while my right brain does it’s psychic and creative thing. When I get too bogged down in the “prove it to me” world of science, I try to remember that science (regardless of its achievements) is limited. And exclusively basing our beliefs in the expectation of scientific validation is limiting. Nature is limitless and is not bound by intellectual awareness, belief or perceptions. Science discovers. Nature creates. Science is the the follower of nature … and often a distant follower of nature. Scientific discovery is the recognition of the “facts” that Mother Nature has known as her “truths” since the perceived beginning of time. The legends surrounding ladybugs are about as prolific as the “in real life”ladybugs that fly about on the spring breeze. One common denominator that seems to cross the boundaries of cultures and of periods of time is the belief that ladybugs are associated with luck, love and the granting of wishes and prayers. that “If you gently cup a ladybug in your hand while making a wish; the released ladybug will carry your wish to the ‘wish – keepers on High’ and truly … if you believe … your wish will come true in the blink of an eye.” It is this wonderful legend that I kept in mind while I created the pattern for the ladybug. 6) Work a sc in each sc around, Slp st into 3rd sc of head. 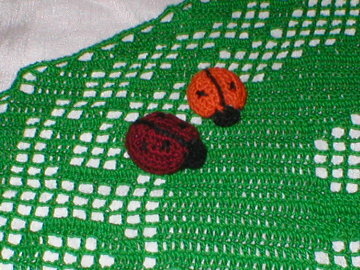 With black or complimentary color thread, Join at the center bottom sc, work surface crochet stitching through top center (including through foundation chain) to center (2nd) sc of head Do not cut thread as you will be working the head with that same thread. Sc decrease through 2 sc, Sc in 2nd sc of head, Sc decrease through next 2 sc. Cut thread (leaving a long tail that will be used for sewing the head top to underside head) and secure thread. Use double thread and needle to make cross stitch dots on back as desired. Work 2 sc in 3rd sc of head, Work a sc in 2nd sc of head, Work 2 sc in 1st sc of head. Work sc decrease through 2 sc, Sc in next sc, Work sc decrease through next 2 sc. “tail” sew top to bottom around the body with whip stitch. Cut and secure thread. Turn ladybug right side out. Stuff with cotton ball. With black or complimentary color “tail” Sew around head. Cut and secure thread. A good way to secure the threads is to insert them deep into the stuffed ladybug body. This hides and secures the ends. Position cotton stuffing as desired.